Mappy is a bit of an odd one. 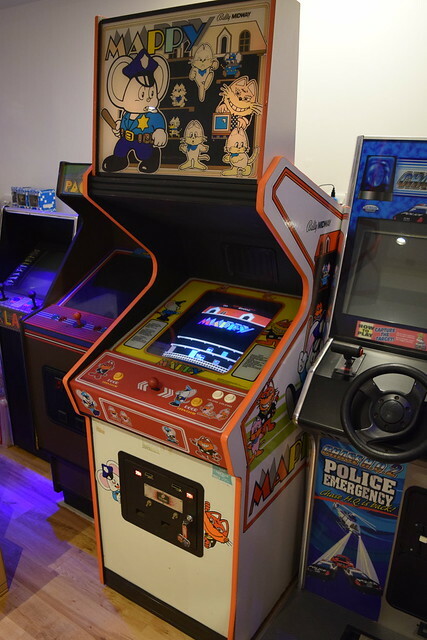 I never played it back in the day and the cabinet wasn’t on my radar, but Mappy is now one of my favourite cabs in my collection. 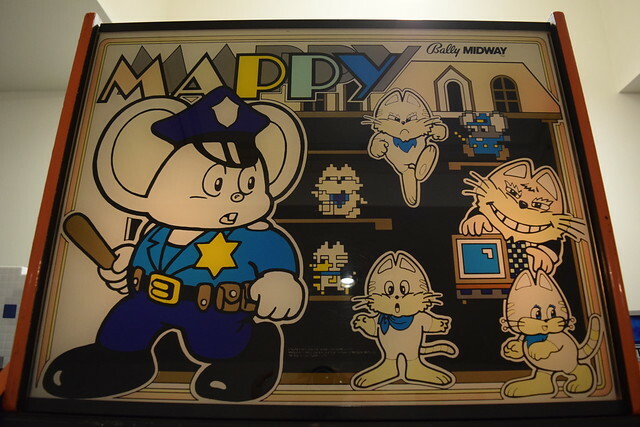 Mappy was developed by Namco in 1983 and distributed in the US by Bally / Midway. 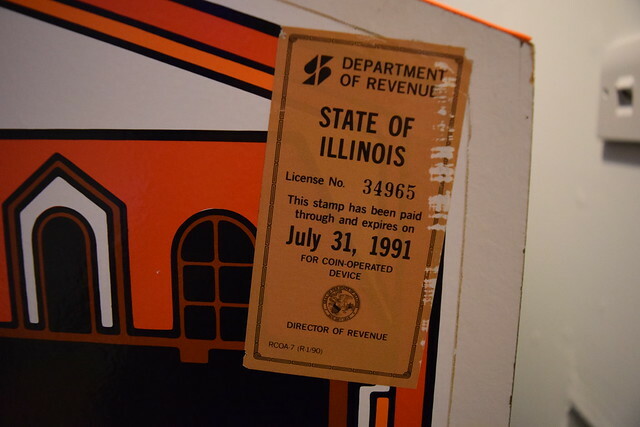 The cab even has all the original license stickers from when it was on site at Illinois. 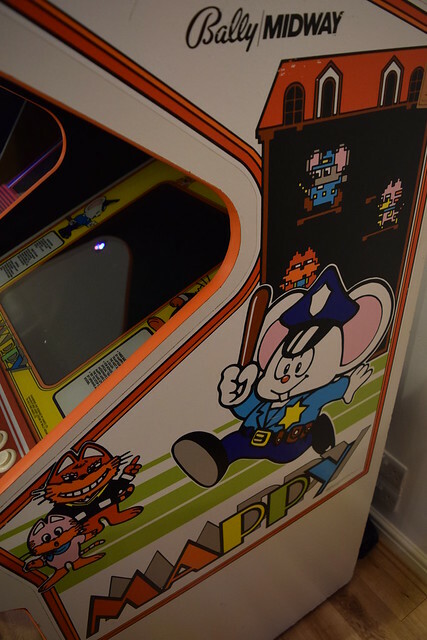 “The player takes the role of a police mouse called Mappy. You must retrieve stolen goods from a mansion of crooked cats, Mewkies and their cat crime boss Nyamco. Mappy can use doors, bells, and even microwaves to slow them down. 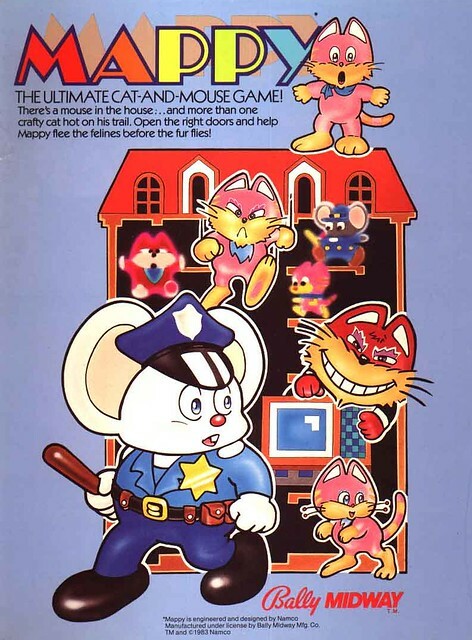 How can Mappy and the cat crime syndicate move between floors? Why trampolines of course! 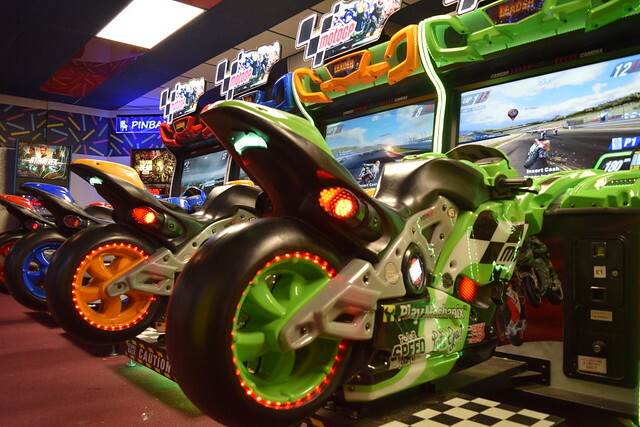 The house is full of them.” I would have loved to be at Namco HQ when the idea was pitched! It sounds a bit crazy, but the game is great fun and very addictive. The cab is a bit of a beast and the design borders slightly on ridiculous, but I absolutely love it. Just Jr. Pac-Man shares a similar cabinet design. 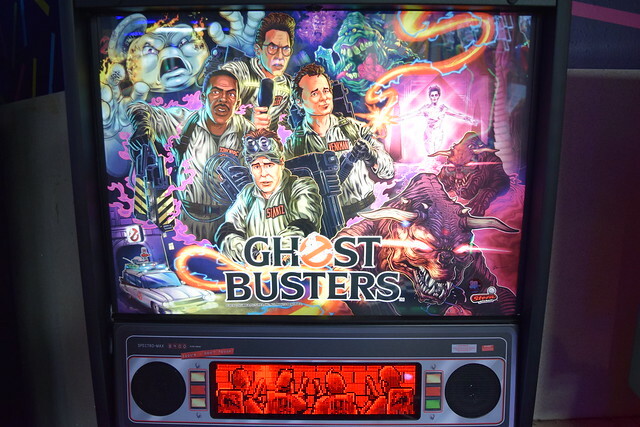 The artwork is great and the oversized marquee gives it a really unique look. I really like the mix of cartoon style and pixel artwork. 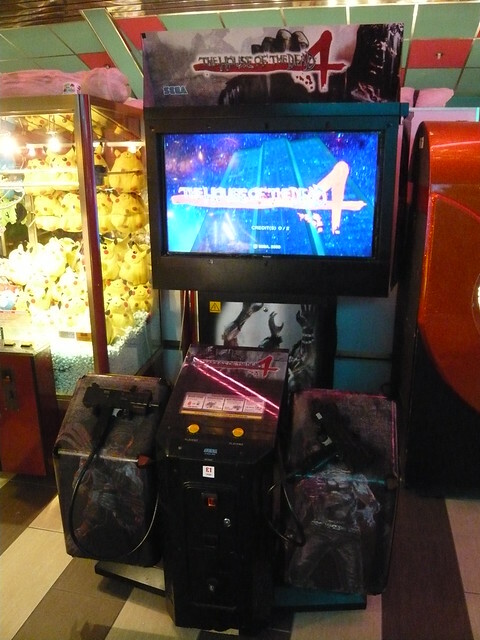 -The cab is in nice original condition, solid and fully working. 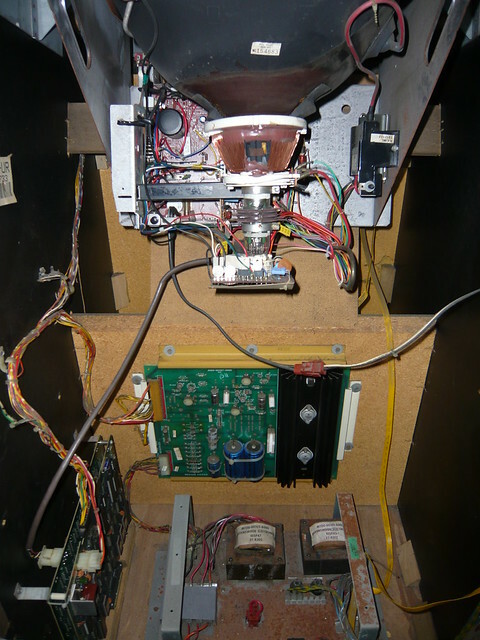 -The monitor is a Wells-Gardner K4600 and the picture is great. 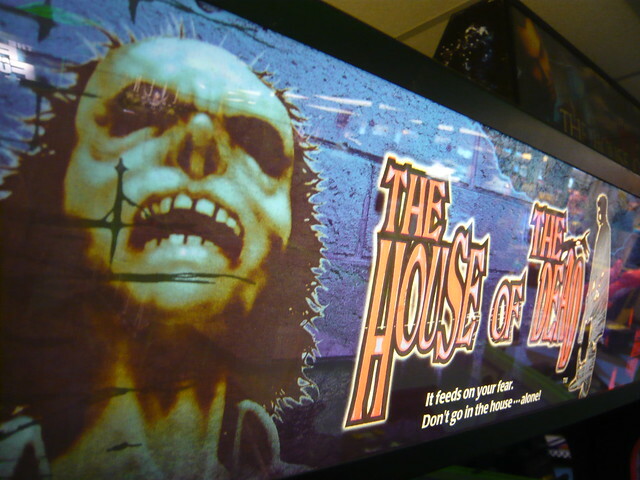 -I love the cabinet design, artwork and oversized marquee. -The glass bezel is in great condition with very little flaking. 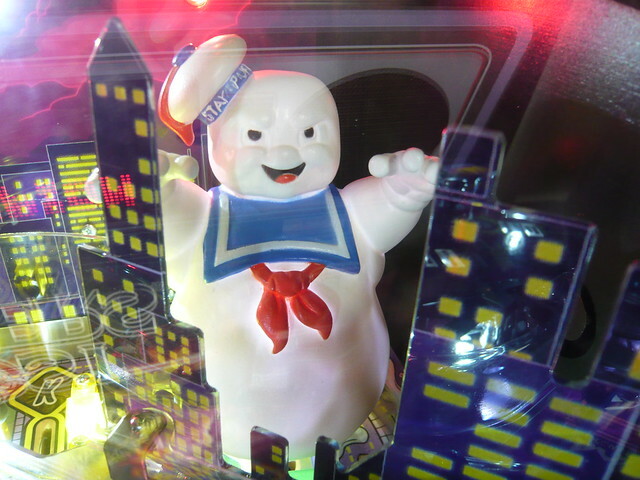 -The cab has nice side art, and good T-moulding. -The cab is extremely clean inside. 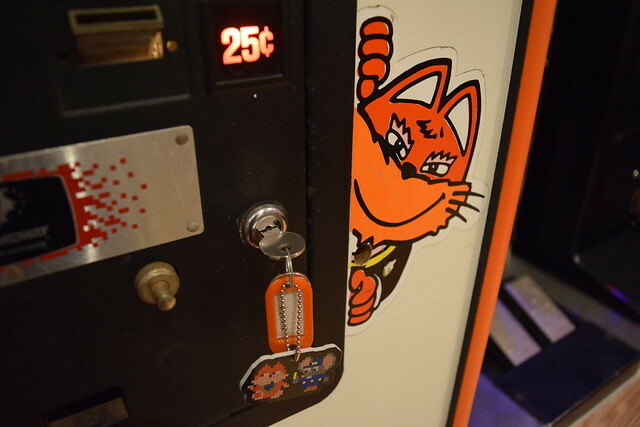 -The coin door paintwork is in good condition. -It came complete with keys. -The monitor has some light burn, although this is not visible through the perspex screen cover. -The back door lock is missing, and is currently secured by screws. -There is rust on the transformer block / fuse holder. -There are some small marks from general wear and tear, and some slight wear on the edges of the side art. -The marquee and bezel are a little faded. -Hey, come on, this cab is over thirty years old! -In fact scrap ‘The Not So Good’, I love it! Now here is the mystery part. 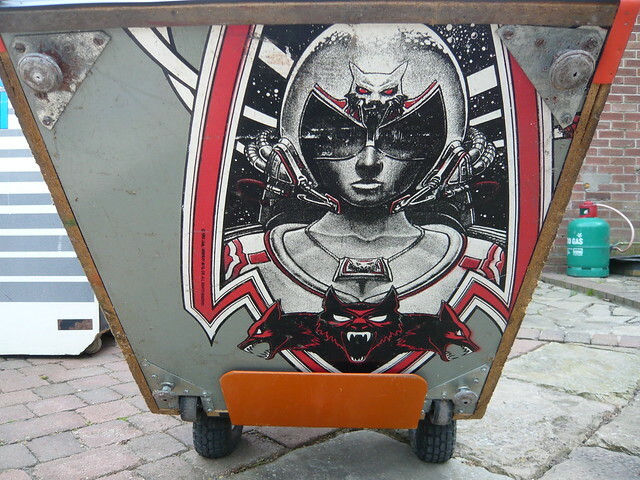 When I was wheeling the cab into my games room, I tipped the cab back on the sack barrow and my wife noticed this artwork on the bottom. 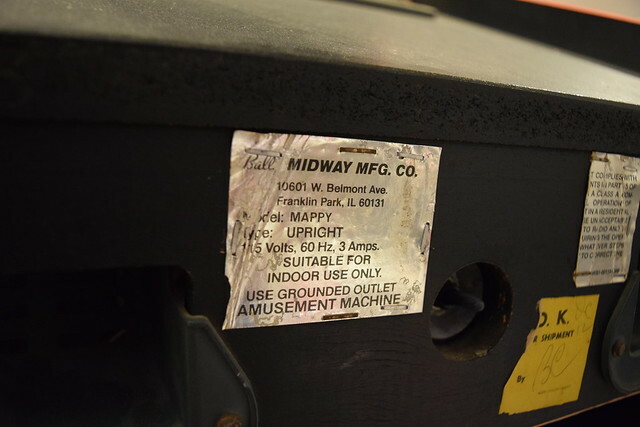 I had read that Bally / Midway used to recycle cabinet parts. 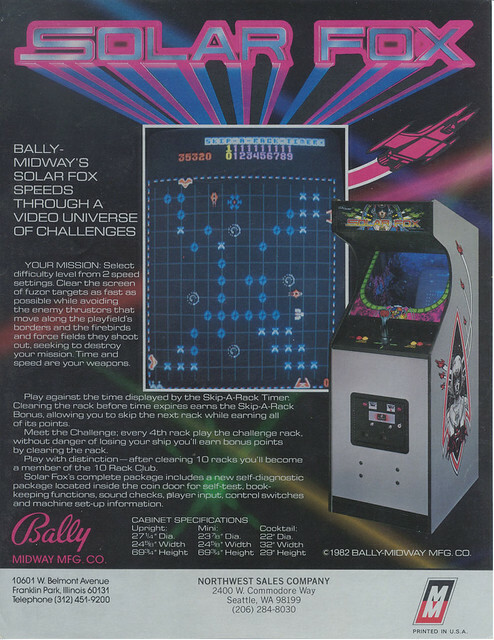 After asking on Ukvac, it turns out that the art is from Solar Fox, a cool looking space shooter and a Pac-Man type game all in one. 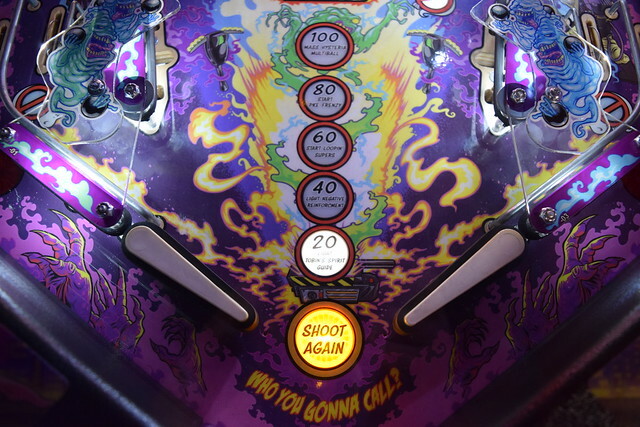 Released in 1981, it seems the game is pretty uncommon and wasn't all that popular. A massive thanks to Muddymusic (Ukvac) for this awesome cab. 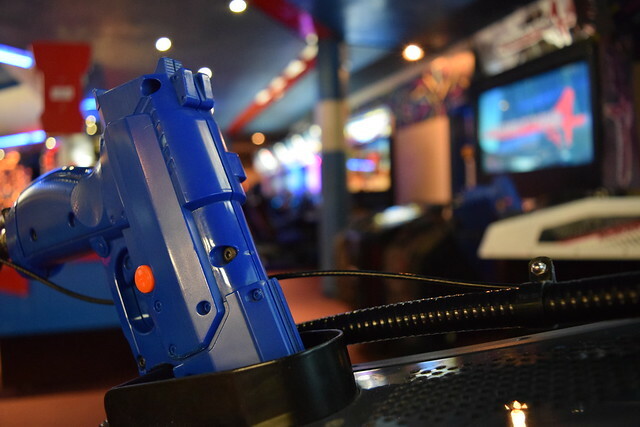 This time work took me to Portland, and I had a chance to check out some arcades during my time there. 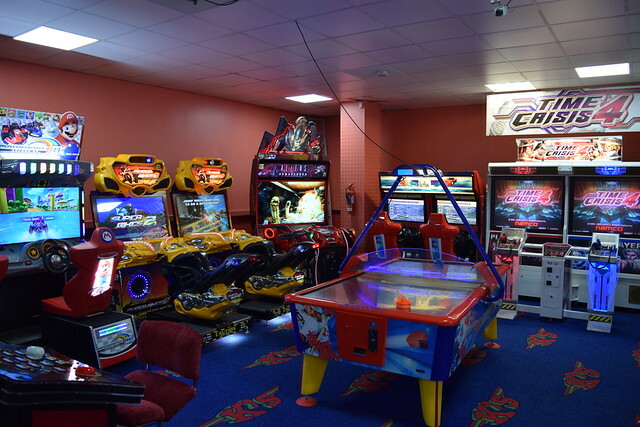 The pier has an excellent selection of modern titles, including Dark Escape 4D, Jurassic Park, Moto GP, Star Wars Battle Pod, Storm Racer G, Terminator Salvation, The House of the Dead 4 and Time Crisis 5. 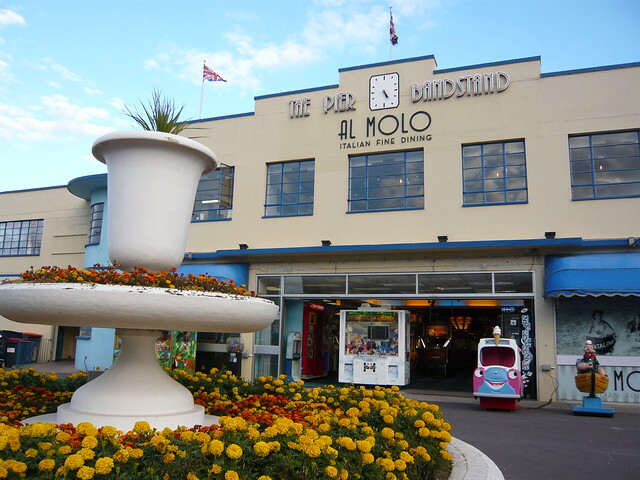 The arcade was very popular, with a lot of families visiting the arcade. 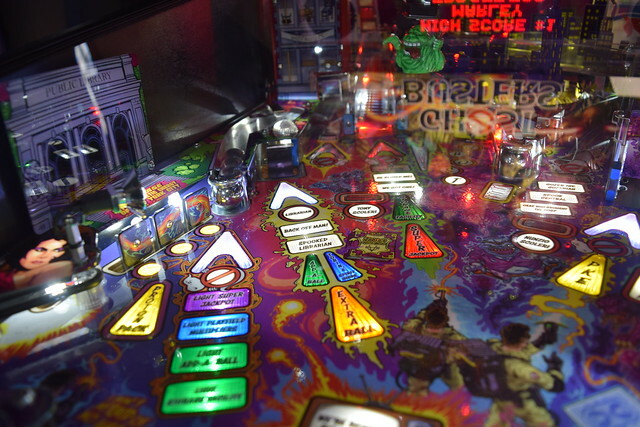 I enjoyed a couple of credits on Storm Racer G, Time Crisis 5 Mastermind Edition and Ghost Busters pinball. 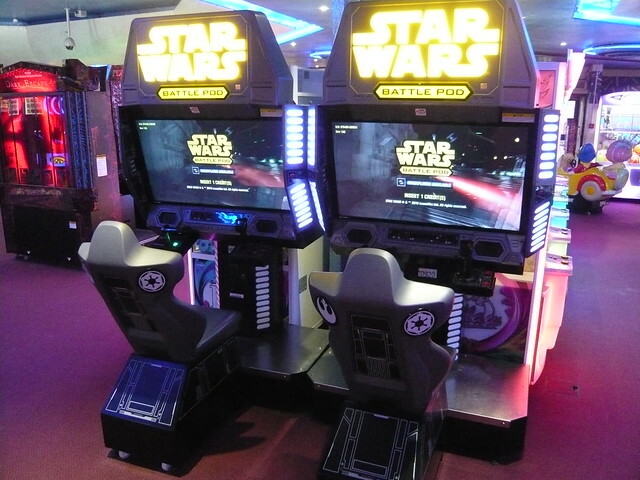 Since my last visit, Star Wars Battle Pod had been replaced by two Flat Screen Editions set up for multiplayer. 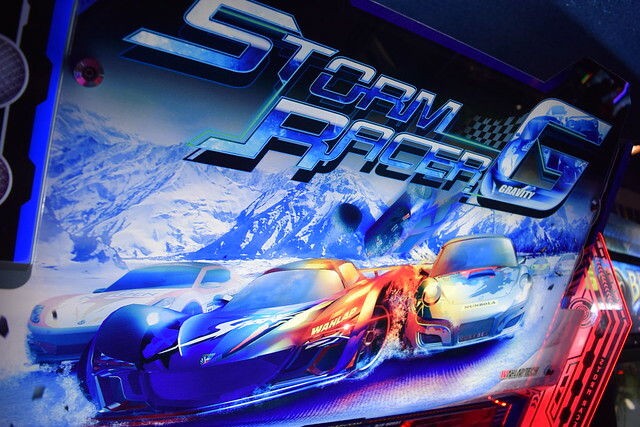 It was the first time I’ve seen Storm Racer G, by Wahlap Tech. 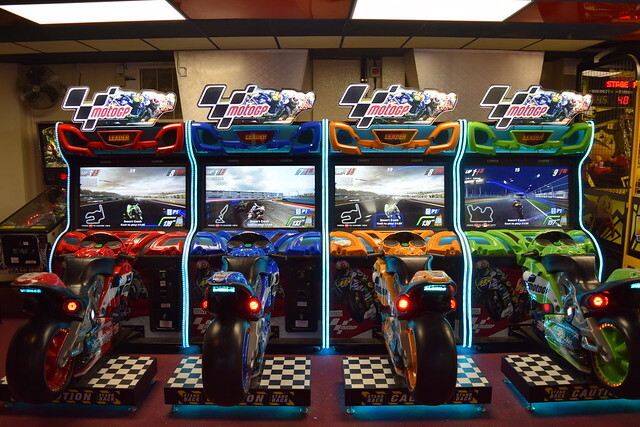 MotoGP, by Raw Thrills is another new addition since my last visit. 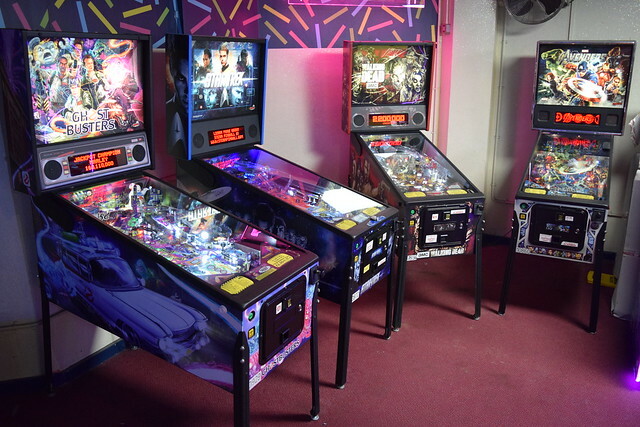 The arcade still has an impressive selection of pinball tables. 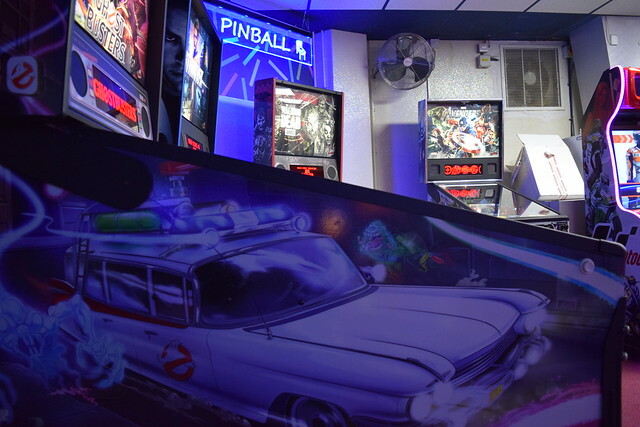 The line-up has altered slightly since my last visit, with the excellent Ghost Busters replacing X-Men. 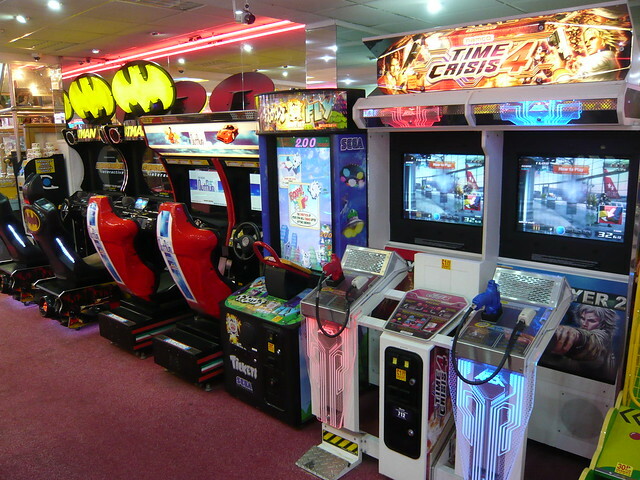 Funworld arcade on the seafront had a fair selection of modern games. 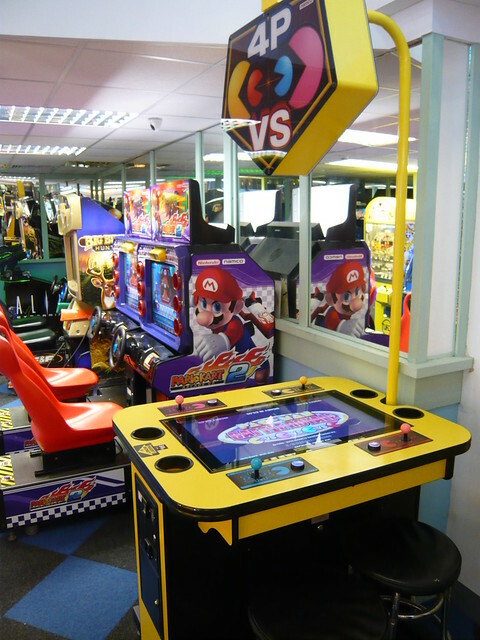 I visited this arcade a couple of times after work, only to find it was closed. 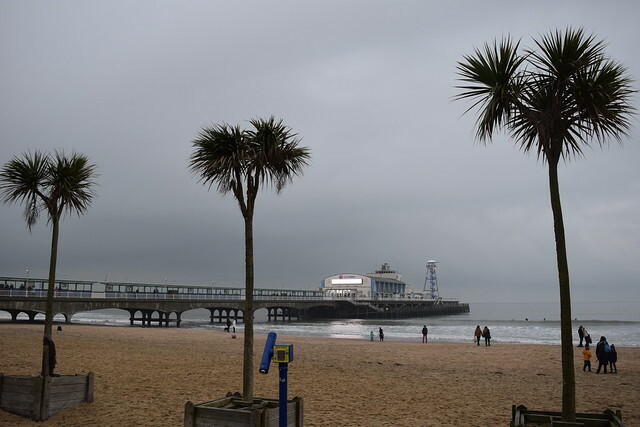 I phoned them up and enquired about the opening hours, and was told it closes between half five and six depending on how busy they are. I finished work a bit early to check it out. 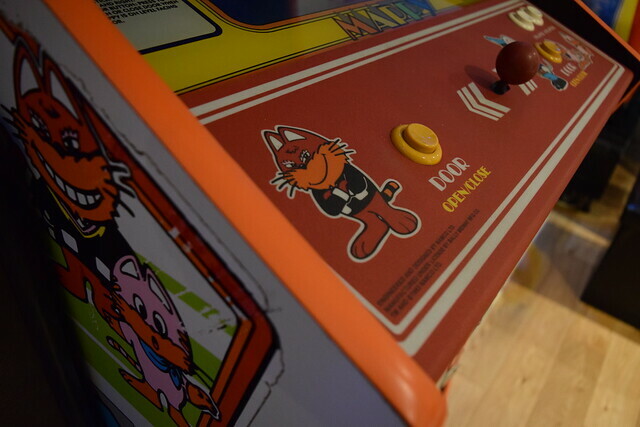 In the window was this very clean Pac-Mania cab. The Op said it was working as well, so not to sure why it wasn’t running? 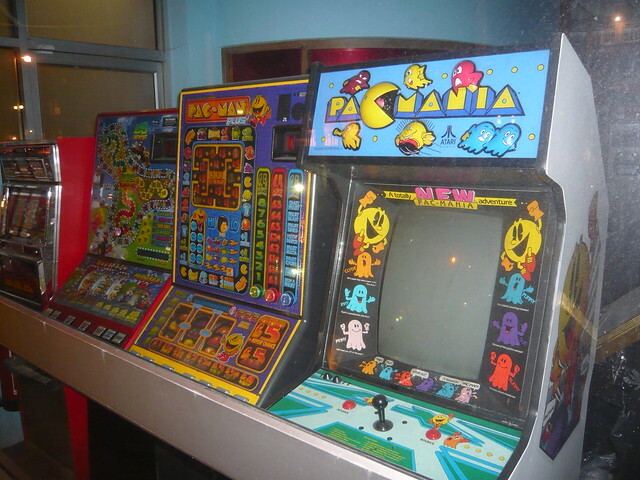 Update: Since my visit, the Pac-Mania ‘window display’ is now back with an arcade collector, the same person who originally sold the cab to the arcade. 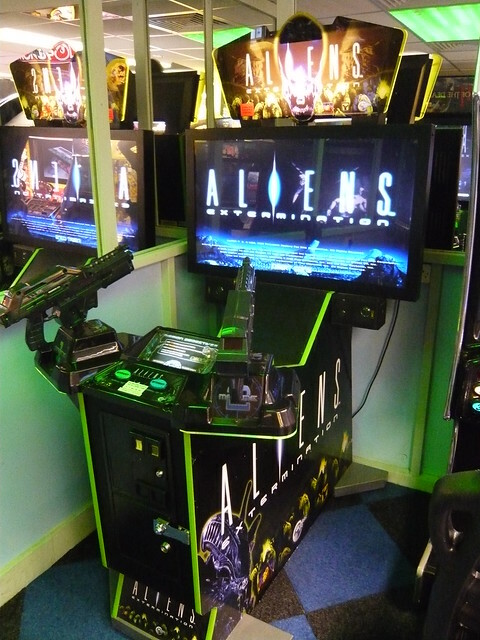 In the arcade I had a couple of credits on The House of the Dead, THOTDIII and Alien Extermination. 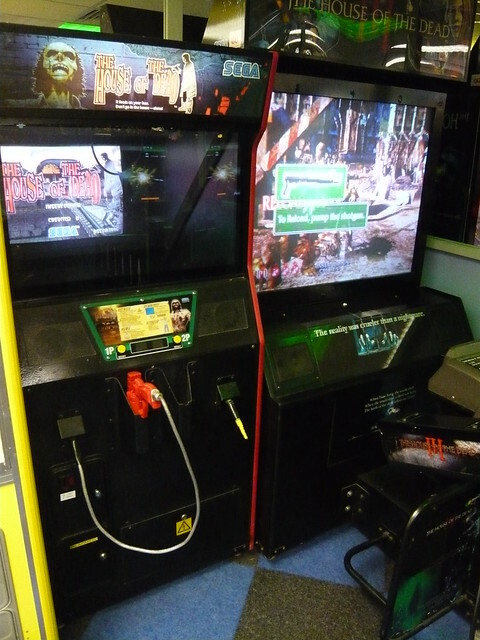 The calibration of THOTD gun was way off and I got killed by the first zombie, but the other games played well and in good condition. 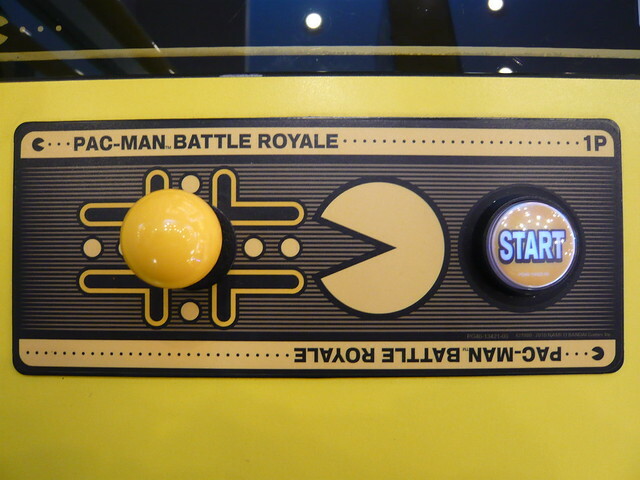 It was the first time I’d seen a Pac-Man Battle Royale cocktail cabinet outside Japan. 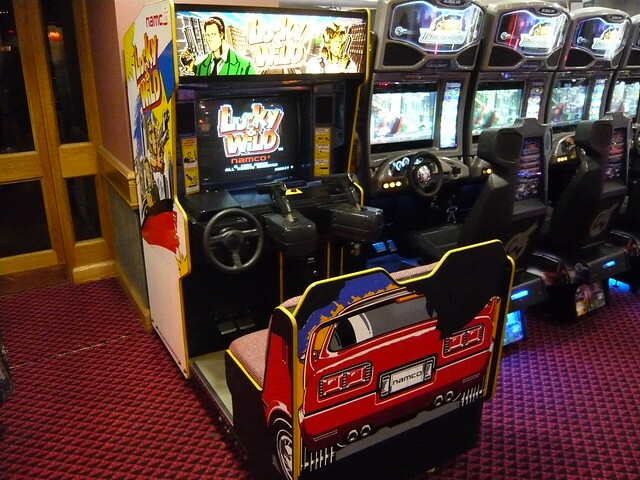 Lucky & Wild and Ridge Racer 2 were nice surprises. 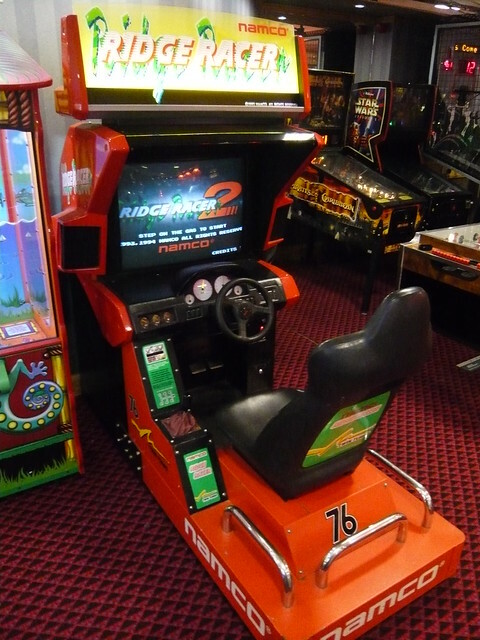 The Ridge Racer 2 was in excellent condition for its age and played well. 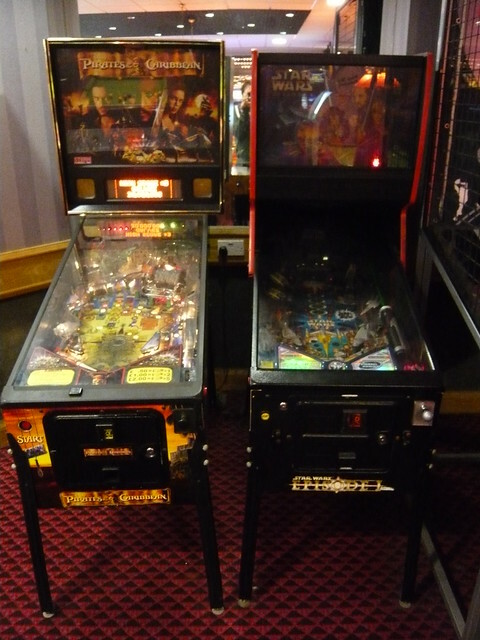 The arcade also had some pinball tables. 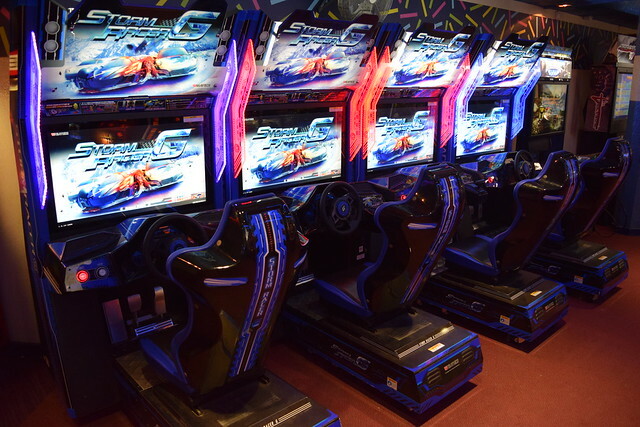 It’s always good to see an OutRun2. The LCD conversion was horrible, but the game was still perfectly playable. 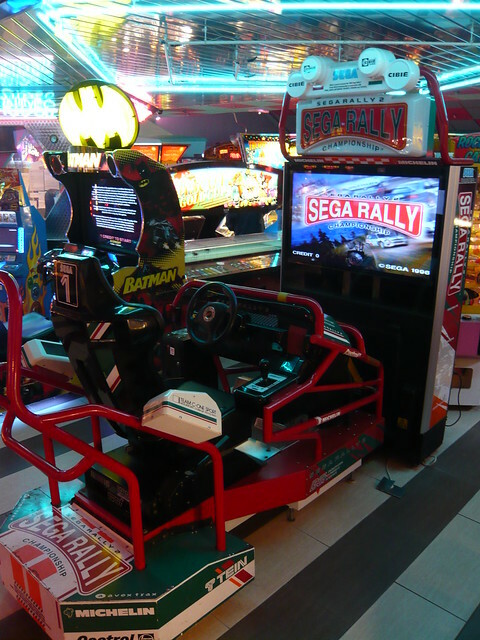 Other than Sega Rally 2 DLX and The House of the Dead 4, there was not much to report here.